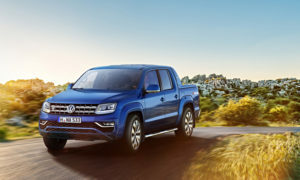 With U.S. sales having more than doubled since 2009, Volkswagen continues its march to sustainable growth with the brand’s most compelling lineup in its history and plans to add several exciting new products and innovations in the near future. Two significant enhancements to the VW lineup are being showcased by tuners at this year’s Specialty Equipment Market Association (SEMA) show in Las Vegas. First, the all-new 1.8-liter and 2.0-liter turbocharged and direct-injection four-cylinder EA888 TSI® engines have been introduced into the lineup. The powerful and fuel-efficient 1.8-liter has begun to replace the 2.5-liter five-cylinder engine, starting in the popular Jetta compact sedan, while the updated 2.0-liter powerplant received a 10 horsepower bump late in the 2013 model year, bringing total horsepower to 210. Second, the brand will embark on its next big market introduction with the launch of the seventh-generation Golf and GTI models in 2014. The automotive aftermarket community has long recognized the performance potential in the lineup and has developed a fleet of highly tuned Volkswagen vehicles for display at the 2013 SEMA show. These include two Jetta models featuring the new 1.8-liter and 2.0-liter turbocharged EA888 engines and a next-generation Golf. The Jetta remains VW’s best-seller, three years after the sixth-generation model was introduced in the U.S. market. But Volkswagen never rests on success and continuously strives to make the Jetta, like every VW, even better. The Jetta is proof of this philosophy, undergoing a number of updates in recent years including the fitment of a new version of the award-winning EA888 2.0-liter turbocharged and direct-injected TSI engine. The new engine makes 210 horsepower (up 10 horsepower over the Gen 2 TSI engine), which helps the Jetta GLI accelerate from 0 to 60 mph a tenth faster with a manual transmission and two tenths quicker with the DSG® dual-clutch automatic. More performance isn’t the only benefit, as the new engine is also more fuel-efficient and weighs in at eight pounds less than the Gen 2 unit. Building on an already formidable 2.0-liter TSI turbocharged engine as its foundation, the FMS Automotive crew tapped the APR for their Stage 3+ Turbo Kit to help boost output to 425 horsepower, more than double the standard output. To help manage the new-found power, the engine was equipped with APR rods, wristpins, and performance pistons. To help it breathe, an APR carbon fiber cold air intake system with intercooler was installed. Despite the massive increase in power, the performance Jetta still runs on 93 octane pump fuel. Handling duties are enhanced by the use of an H&R Street coil-over suspension system coupled with H&R Sport anti-roll bars. Silver 19-inch TSW Jerez wheels with chrome lips and wrapped in Nitto NT-05 Z-rated tires provide more grip. With so much more power, this high-performance Jetta needs more stopping power, which the FMS Automotive team found from braking powerhouse Brembo with a set of performance four-piston calipers and cross-drilled rotors. With all of the performance bases covered, a SEMA show car wouldn’t be complete without striking design enhancements. Out front, the build team combined the Jetta Hybrid grille and the Golf R front fascia with a custom front splitter. All four fenders were widened by approximately two inches, while the team converted the GLI rear bumper to a custom wide-body piece that accommodates a dual-exit exhaust with oval tips. Custom Golf R side skirts were added along with all-new FMS Automotive body side moldings set for release at this year’s SEMA show. To round out the exterior upgrades, the performance Jetta features matte-finished Candy White premium Axalta Coatings paint. Underscoring the street performance theme, the roof, rear spoiler, and front grille are accented with gloss black paint to create a sporty contrast. Inside, the team at FMS Automotive left no stone unturned. The front seats were replaced with black and beige Recaro Sportster CS units and FMS matched the updated reupholstered rear seats, door trim, steering wheel, handbrake, and gear shifter. Volkswagen provided a suite of technology enhancements including LED lighting, a full RNS® 315 navigation system with rearview camera, a custom sound box and digital sound processer, and aesthetic pieces such as aluminum pedal caps and door sills. Rounding out the interior, ECS Tuning contributed an integrated digital vent gauge, while Corinthian Textile Solutions provided a custom trunk liner and floor mats. In addition to the FMS Automotive performance Jetta, an additional Volkswagen Jetta equipped with VW’s all-new 1.8-liter turbocharged Gen 3 EA888 engine and the all-new, seventh-generation Golf will debut at SEMA. Helios Special Edition Jetta GLI Tribute As well as showing its ultimate street performance Jetta, FMS Automotive took another Mk6 Jetta featuring the all-new 1.8-liter turbo engine and built a tribute to the 1989 Helios Special Edition Jetta GLI. With the exterior painted in the same Helios Special Edition blue-and-black paint scheme of the late ‘80s original, other key features from the fabled limited-edition model have been incorporated into the 2014 tribute. 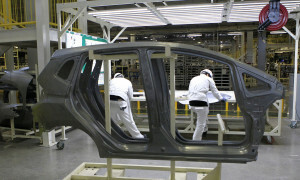 The VW accessories team provided a body kit for the Jetta and FMS Automotive added custom body side moldings. Other accent pieces, including the rear spoiler and side mirrors, are painted to match the Helios blue/black paint design theme. Larger Golf R brake calipers custom painted with the “Helios” logo replace the stock pieces and 19-inch Volkswagen Motorsports wheels coated in ceramic gunmetal gray and wrapped with Nitto Invo 235/35 ZR-rated tires are employed on all four corners. A custom exhaust system was also added for more style and a performance sound. Inside, Recaro Specialist seats were reupholstered in Helios-inspired blue, black and gray striped inserts. The back seats, steering wheel, handbrake, and shifter were reupholstered to match the Helios theme throughout the car while Corinthian custom textile floormats and a trunk liner with embroidered light blue “Helios” logo were installed. VW brushed aluminum pedal caps and aluminum door sills, the RNS 315 navigation system with rearview camera and a custom sound box with digital sound processer round out the long list of interior enhancements. The Helios Tribute Jetta will also be on display at booth #20255 in Central Hall from November 5 to 8. H&R Volkswagen Golf Suspension tuner H&R has once again chosen a Volkswagen to build as a SEMA project car: this year, it’s the all-new seventh-generation Golf. VW’s best-selling vehicle around the world creates the ideal canvas to showcase some of the latest suspension innovations from H&R. For a more sporting stance and added performance, H&R installed a Street Performance Tuner Coil Over suspension system and H&R 26mm Sway Bars front and rear. The special coil-over setup adds more athletic suspension performance for the Golf’s new MQB platform, set at a lowered ride height of 1.5 inches in the front and 1.75 inches in the rear. Added stopping power comes from a Brembo High Performance GT brake system featuring lightweight 12.9-inch diameter, two-piece discs with a custom silver bell and four-piston orange calipers. Goodridge stainless steel brake lines complete the upgraded system. The new Golf also receives new shoes for SEMA, with a set of SNA-style, forged three-piece concave Rotiform wheels that have a custom brushed finish with matte tinted clear centers and brushed low gloss clear lip. The Rotiform wheels are wrapped in 225/35ZR 19 Michelin Pilot Super Sport tires. Completing the high performance package is a VW Accessories body styling kit, center exit rear valance and dual exhaust muffler, and a race-inspired hatch top spoiler.